Suspend SC insecticide is a suspended concentrate containingDeltamethrin. Suspend SC broad label includes the control of ants(Suspend makes an effective ant spray killer), spiders, roaches,flies, mosquitoes, fleas, wasps and hornets, centipedes,millipedes, pantry pests, silverfish, bedbugs, beetles and manymore. Suspend SC leaves a clear residual on surfaces that keeps onkilling pests for up to 3 months. Suspend SC Insecticide is anEXCELLENT general purpose perimeter pesticide for use both indoorsand outdoors. SUSPEND SC Insecticide with DeltaGard offers the benefits of deltamethrin in a concentrated suspension of pure micro-crystals. The micro-crystals give Suspend SC a long residual (up to 3 months), and instead of being absorbed into porous materials, they stay on the surface. As a result, insects continue to contact them long after the insecticide has been applied. Yet Suspend SC leaves no visible residue, has virtually no odor, and won't clog spray equipment. 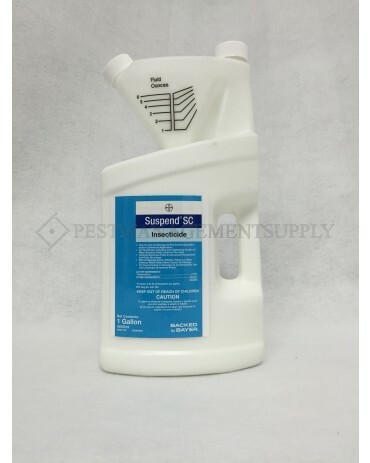 Suspend SC is a residual concentrate in the synthetic pyrethroid family of insecticides. The active ingredient Deltamethrin kills by acting as a high-power poison to the insect's central nervous system. Once poisoned, the insect’s nerve cells become excited, causing paralysis and eventual death. Suspend SC is diluted with water and applied with a sprayer. Once the product has dried, pests easily pick up the millions of microscopic particles left behind, and the active ingredient kills by contact and ingestion. Though Suspend SC is deadly to insects, it is very gentle on people and pets, when used properly, and is labeled for outdoor and indoor crack and crevice use. The formulation of Suspend SC is a Suspended Concentrate, meaning finely ground particles of the active ingredient are suspended in water. Suspend SC has no additional solvents, but it does contain surfactants to help suspend the solid particles and biocides to prevent microbial growth and extend the shelf life. Suspend SC controls a wide variety of crawling, flying, turf, and ornamental pests found in and around households, including, but not limited to, ants, bed bugs, beetles, boxelder bugs, chinch bugs, fleas, mosquitos, pantry pests, roaches, and spiders. Suspend SC is a versatile insecticide approved for a wide variety of uses including indoor and outdoor, residential, industrial, and institutional applications. It's even approved for use in restaurants and other places where food is manufactured, processed or served. Outdoors, it can be applied to turf grass and landscape ornamentals. It's highly effective against many important pests from ants and cockroaches to spiders, scorpions and bedbugs. 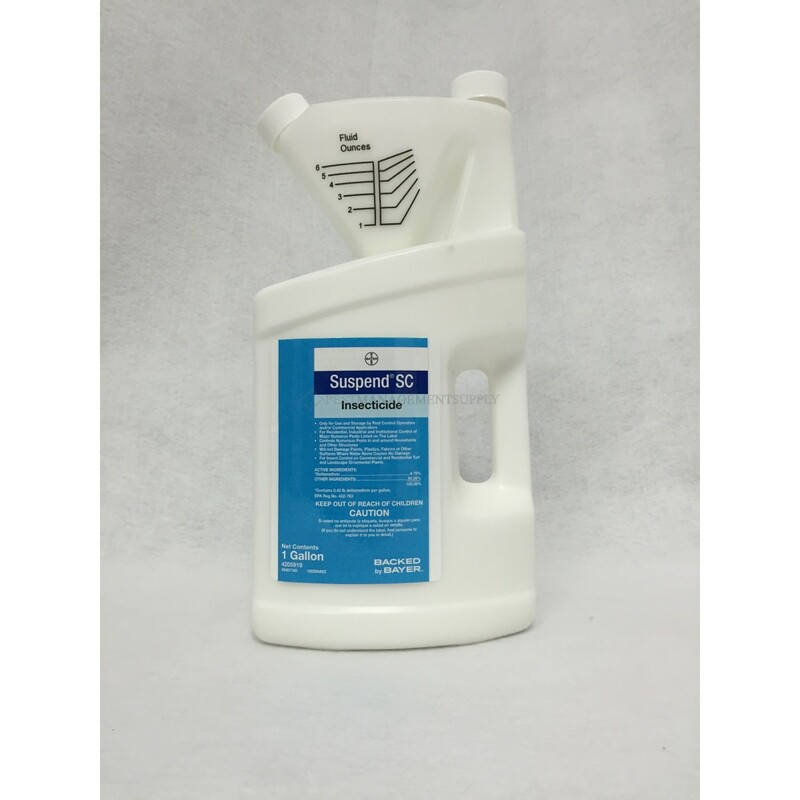 Suspend SC is a liquid insecticide concentrate which must be diluted with water and applied with a sprayer. It is best to shake your Suspend SC container a few times before dispensing, in case of any settling of solids. 1 Pint (16 oz.) of Suspend SC concentrate yields 10-64 gallons of finished solution, depending on mixing rate used. 1 Gallon (128 oz) of concentrate yields 85 to over 500 gallons of finished solution. One gallon of finished solution should cover approximately 1,000 square feet. Suspend SC may be applied as a crack and crevice or spot treatment in residential buildings and structures. Use 0.25-0.75 fl. oz./gal. of water for most treatments. Treat where pests are found or normally occur, such as around floors, baseboards, expansion joints, around water and sewer pipes, and voids formed by equipment or appliances. For spot applications, use a low pressure system with a fan-type nozzle to apply spot treatments. Do not treat entire floor, carpet or floor covering. Do not apply as a space spray. Application to furniture should be restricted to areas where prolonged contact by humans will not occur. Suspend SC Insecticide can be converted to a foam and the foam used to treat structural voids to control insect and arthropod pests in walls, under slabs or in other void areas. Bed bugs – Remove linens and wash before reuse. Apply to mattresses as a spot treatment, especially tufts, folds, and edges until moist. Apply to the interior of the frame. Allow to dry before remaking bed. We do not recommend Suspend SC as the sole treatment for bed bugs - instead it is recommended to use a variety of bed bug control products. There is also a high risk of resistance when using Suspend SC for bedbug treatment. See Get Rid of Bed Bugs for complete treatment recommendations. Carpet Beetles, Fleas and Ticks – A total integrated pest management program is recommended. It is suggested that infested areas be thoroughly vacuumed prior to treatment. These areas include all carpet, upholstered furniture, baseboards and other indoor areas frequented by pets. The vacuum cleaner bag should be discarded in an outdoor trash container upon completion. Pet bedding should be cleaned or replaced. Apply Suspend SC Insecticide as a uniform coarse low-pressure spot or crack and crevice treatment to areas where these pests normally inhabit. Care should be taken to limit spot treatments to pet bedding and its surrounding area, infested floor coverings and pest habitats. Do not treat entire area of floor, carpet or floor coverings. Do not apply as a space spray. Restrict applications to furniture where no prolonged contact by humans will occur. Do not allow people or pets to contact treated areas until spray has dried. This product can be used with an Insect Growth Regulator (IGR). Effective flea control includes controlling the source of flea infestations. This can require treatment of pets with a product registered by EPA for such use and treating outside areas frequented by pets. Suspend SC Insecticide can also be applied out-of-doors for flea control. Do NOT treat pets with this product. Use Suspend SC Insecticide to control outdoor pests by application as either a perimeter treatment, residual spray or broadcast application to lawns, grounds, and ornamental plantings. For residual control, apply Suspend SC as a coarse low-pressure spray at the rate of 0.75 to 1.5 fl. oz./gal. of water to surfaces of buildings, porches, screens, window frames, eaves, patios, refuse dumps, garages, and lawns. 1 Gallon of finished solution will generally cover 1,000 square feet when using a hand pump sprayer for spot or perimeter treatments. Fire ants - Apply Suspend SC Insecticide as a drench. Dilute 1.5 fl oz per one gallon of water. Gently sprinkle 1 to 2 gallons of the diluted insecticide over the surface of each mound and surrounding area to a 2-foot diameter. For best results, apply in cool weather, 65 to 80°F or in early morning or late evening hours. Treat new mounds as they appear. Pressurized sprays may disturb the ants and cause migration, reducing product effectiveness. Turf-grass applications – Uniform coverage is essential. Apply Suspend SC as a broadcast application using a conventional hydraulic boom-type sprayer or similar suitable equipment using a minimum of 2 gallons of water per 1000 square feet and 0.4 to 0.9 fl. oz./1000 sq. ft. (17.5 to 39 oz. per Acre). Delay irrigation or mowing for 24 hours after application for surface feeders such as cutworms and webworms. For sub-surface feeders such as mole crickets, irrigate with 0.25 to 0.5 inch of water immediately after application. Ornamantel pests – Apply 4 to 8 fl. oz. per 100 gallons of water. Apply when pests become evident. Thorough coverage is required for best results. Apply with sufficient water to ensure coverage of upper and lower leaf surfaces. See complete product label for additional instructions on outdoor applications. Broad pest and application site label makes Suspend SC an extremely versatile and popular product! Suspend SC Insecticide may be tank-mixed with other currently registered pesticides unless expressly prohibited by the product label. Allow at least 30 minutes after application before allowing pets or children into treatment area. For best results, allow 24 hours after outdoor application before expected rainfall or watering. Some applications may require irrigation. Store out of direct sunlight and extreme temperatures for maximum shelf life. We recommend using your product within 3 years of purchase. More frequent applications may be needed on concrete or similar porous surfaces. Shake Suspend SC before dispensing in case of any settling out of the solids. Any separation does not adversely affect efficacy of the product as long as the container is shaken before dispensing.